Emporia Symphony Orchestra presents its last concert of the season, “Grand Finale,” at 7:30 p.m. Tuesday in Albert Taylor Hall. Guest conductor Glenn Block will be leading the orchestra. Block is the Director of Orchestras and Professor of Conducting at Illinois State University. From 1983-2007, he led the Kansas City Youth Symphony program to being one of the largest and most recognized youth symphony programs in the country. 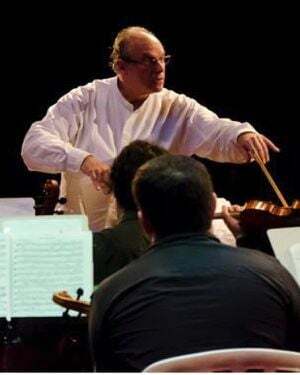 Prior to going to Illinois in the fall of 1990, Block served for 15 years as Director of Orchestras and Professor of Conducting at the Conservatory of Music of the University of Missouri — Kansas City and Music Director of the Kansas City Civic Orchestra. The first half of the concert features a reduced orchestra to perform J. S. Bach’s Orchestral Suite No. 3 and Ibert’s Concertino da Camera for saxophone and orchestra. Javier Chavez is the soloist, winner of the concerto/aria competition. Chavez (saxophone) was born and raised in Emporia. He is an Emporia High School graduate and is in his junior year at Emporia State University, studying music education and saxophone performance with Dawn McConkie. He also studies tuba under the instruction of William Woodworth IV, and is the current sousaphone section leader in the Marching Band. His most recent accomplishments include Concerto/Aria competition winner at ESU, as well as placing second at the Honors Recital in 2018. The second half of the concert features the full orchestra with an American Premiere and two iconic pieces from the standard orchestral repertoire. Ramiro Miranda will be leading the orchestra on the premiere of “Gion Overture” by José Gonzalez Granero, a Clarinetist and composer based in the San Francisco Bay Area. Gonzalez Granero was recently the First-Prize Winner for the Villiers Quartet New Works Composition Competition (London), and he also has been nominated twice for the Hollywood Music in Media Awards. He holds the Principal Clarinet position for the San Francisco Opera Orchestra since 2010. He graduated from Granada Royal Conservatory, USC Thorton School of Music and The Colburn School in Los Angeles under his mentor Yehuda Gilad. “Gion Overture” was inspired by the historical neighborhood of Gion in Kyoto, Japan. The third movement of Tchaikovsky’s Symphony No. 5 features one of the most beautiful melodies in orchestral music, featured first by the solo horn. Finally, the March to the Scaffold by Berlioz ends the night with a full orchestra.